"What I love the most is the element of serendipity involved in my work that keeps it both addictive and exciting!" Using a unique casting process, I Spy Artisan Jewelry merges ancient technique into a modern collection with texture and gemstones for everyday wear with an unusual twist. A self-professed jewelry junky growing up in the UK, Lisa was drawn to and intrigued by the malleable properties of metal and its adornment during her first metal working class at school at the age of 11. However, coming from a family heavily grounded in science and medicine meant that studying for a degree in silversmithing was never an option for her. Determined not to let this stop her, her silversmithing training followed a less traditional path that began in an old stainless-steel factory in Sheffield that had been converted into metal working studios. Taking silversmithing classes in these studios in the evening while studying for a PhD in reproductive immunology involved two bus rides and a mile walk to the studio. However, distance was not an obstacle, as she was instantly hooked and hungry to learn more, and the creative high carried her through graduate studies. Following graduation, Lisa relocated to the US for marriage and work and continued taking evening classes in fabrication, enameling, and casting whenever work and family commitments permitted. She began selling her pieces through small galleries and gifting them to friends and family and from the feedback received was encouraged to continue learning and creating. 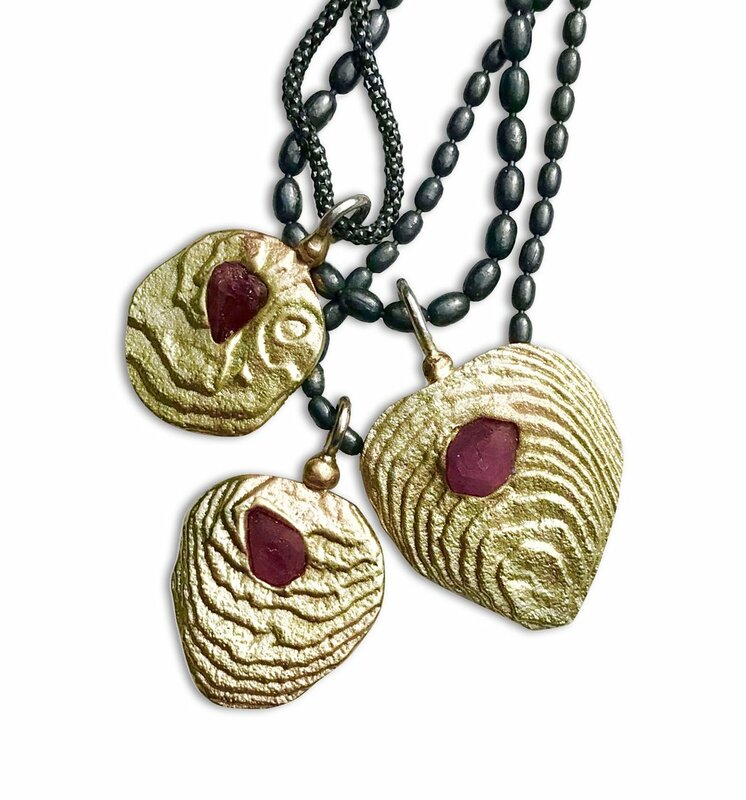 However, it wasn’t until a lost wax casting class in which she began to experiment with casting rough cut gemstones directly into metal that she truly felt that she found her niche and voice as a jewelry artist. There was a raw organic simplicity to the pieces that spoke to her. Curious whether the results could be replicated using cuttlefish casting, she began experimenting. Unlike wax casting, the process required a lot more refinement and practice to ensure that the molds she created allowed the stones to be sufficiently anchored into the metal. Once she had mastered the mechanics of the technique, she began to use the beautiful patterns and striations of the cuttlefish bone to guide her creative process. She also made the jump from rough cut to faceted gemstones, as they seemed more cohesive with the aesthetic of the cuttlefish bone. Each cuttlefish bone is unique (like a fingerprint) and she can tell instantly the piece it will eventually become. There is something quite palpable and intriguing about molten metal and its mercuryesque glow that draws Lisa as a jewelry artist and scientist to explore and experiment. The cuttlefish bone presents the perfect canvas to experiment with; its layers can be peeled back to reveal patterns and striations that mimic ripples on the sand, the very habitat in which this ancient marine creature dwelled, that can be incorporated into a mold and transposed onto metal. Using the textures and patterns of the cuttlefish bone to drive the creative process, which often centers around stones directly cast into molten metal, Lisa is able to capture a fluidity in her pieces that is reminiscent of the sea, immortalized in time. Her work continues to evolve as she experiments with and pushes boundaries using more non-traditional techniques to cast and set stones in place during the casting process. The stones have to be hard enough to withhold the temperatures of molten metal, such as sapphires, diamonds, and rubies, and the results are both unpredictable and striking.